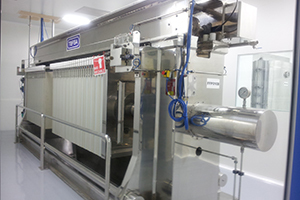 TEFSA has supplied to the gelatins manufacturing company JUNCÀ GELATINES, located in Banyoles (Spain), two filter presses model PSEH-1000 for food application. These units are used in the gelatin clarification process, product that Junca Gelatines distributes around the world. 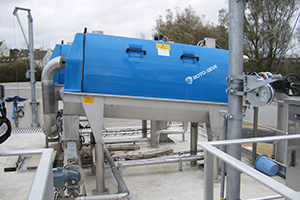 The filter presses incorporate gasketed plates with FDA certificate, stainless steel cladded frames and completing the supply with the PLC control panel allowing a full automatic filtration process. Tragsa company has awarded Sereco Gestion the works for the completion of the decontamination of the Flix reservoir. 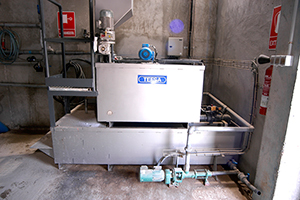 For this purpouse, TEFSA has supplied Sereco Gestion with 2 thickeners with a diameter of 22 meters and 7 filter presses PEH 1300, including the auxiliaries for the treatment of the sludge generated during the cleaning process. TEFSA was present with own booth in the past «ACHEMA 2018» Industrial process show to be held in Frankfurt (Germany) from the 11th to 15Th of June 2018. «ACHEMA» is World Forum and Leading show for the Process Industries, celebrated at the «Frankfurt am Main» in Germany. TEFSA was present with own booth in the past «IFAT 2018» water show held in München (Germany) from the 14th to 18th of May 2018. «IFAT» is world’s Leading Trade Fair for water, Sewage, waste and Raw material management, celebrated at the «Messe München» in Germany. 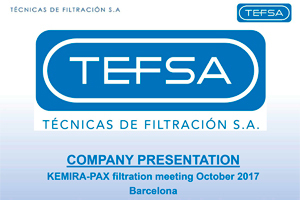 On last October 25, 2017 TEFSA held a talk to the KEMIRA Group regarding PAX filtration. The talk was held at the TEFSA facilities and was attended by KEMIRA technicians from around the World. 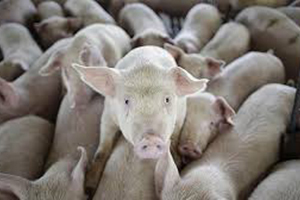 The OKOTEC Biogestion company has developed a project with TEFSA for the liquid manure treatment. 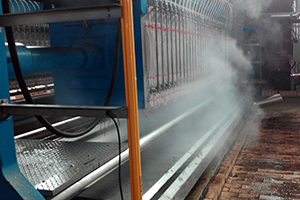 By means of this treatment we can obtain a solid fertilizer, a semi-liquid fertilizer and an osmotic water from the liquid manure. 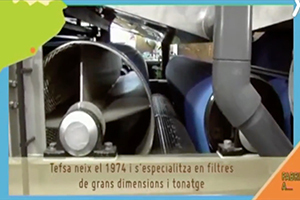 The TEFSA Group, by means of the daughter company COMERCIAL LASMERT, was present at the fair "Pumps & Valves" held in Bilbao from 6 to 8 June 2017 in Pavilion 2 Stand C16. 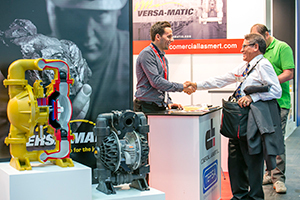 «Pumps & Valves» is an international exhibition for pumping systems, valves and industrial process equipment, celebrated every two years at the «Bilbao Exhibition Centre». TEFSA was present with shared booth with our agent ATB NEDERLAND in the «AQUA NEDERLAND 2017» exhibition to be held in Gorinchem (The Netherlands) on March 21-23, 2017 with Stand number 353. 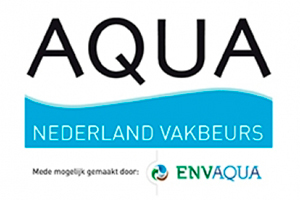 «AQUA NEDERLAND» is a specialized and professional exhibition for the water treatment industry products and services, celebrated at the «Everementenhal Center» in Gorinchem. 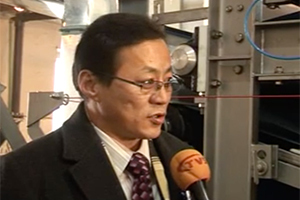 Mongolian television program on the inauguration of Ulaanbaatar waste water treatment plant in Mongolia where Tefsa has supplied 2 belt filter units with a thickening stage table. TEFSA has supplied to ENVISAN two thickeners with 22’5 m diameter in Oskarshamn (Sweden) to thicken the sludge dredged for the decontamination of the harbor. These two thickeners are equipped with effort sensor, automatic lifting device and undeflow control. The whole System is controlled remotely via PLC’s and touch screens. 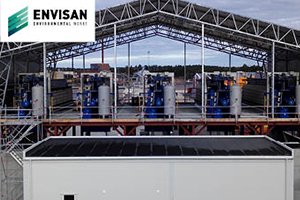 TEFSA has supplied to ENVISAN five filter presses with 160 plates of 1500X1500 each one in Oskarshamn (Sweden) for the dehydration of dredged sludge for the harbor decontamination. These filters are equipped with drip trays, cloth washing devices at 100 bar water pressure, cloth acid wash system and double body pumps to work at 12 bar feeding pressure. The whole system is completely automatic and remotely controlled via PLC’s and touch screens. 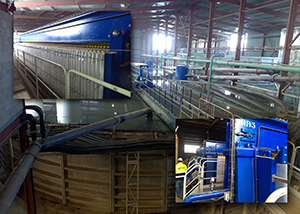 TEFSA has provided in Mina Sonia (Lugo, Spain) a complete full automatic plant for the sludge dewatering and water recovery of the quartz sands washing process. 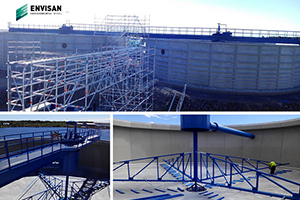 The plant consists of a Ø17 meter thickener, a Ø14 meter clean water storage tank, an automatic polyelectrolyte preparation station, a 1300x1300 mm plate overhead filter press, a Floc-Control polymer consumption system, corresponding pumps and other accessories. 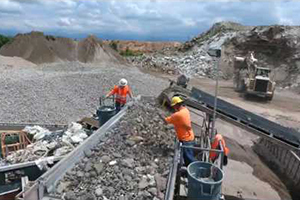 Through the local TEFSA-USA Office based in Oceanside CA, TEFSA has supplied one full automatic overhead filter press model PEH to the company RAMCO based in Sun Valley CA (USA) for the sludge dehydration process of recycled aggregates materials. 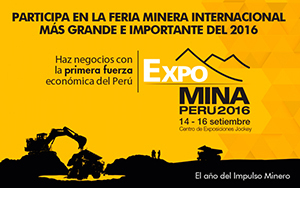 TEFSA was present with own booth in the past «EXPOMINA 2016» mining show to be held in Lima (Peru) from the 14th to 16th of September 2016, on Stand 21 in the «Spain Pavilion». «EXPOMINA» is a specialized and professional exhibition for the mining industry products and services, celebrated at the «Centro de Exposiciones Jockey» in the Peruvian capital. TEFSA was present with own booth in the past «KHIMIA 2016» chemical show to be held in Moscow (Russia) from the 19th to 22nd of September 2016, in Hall 1, Pabillion 2 Booth 21D72. 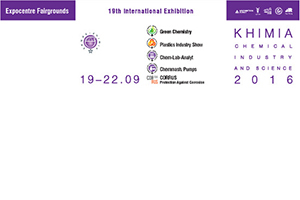 «KHIMIA» is an international specialized and professional exhibition for the chemical industry and science products and services, celebrated at the «Expocentre Fairgrounds» in the Russian capital. 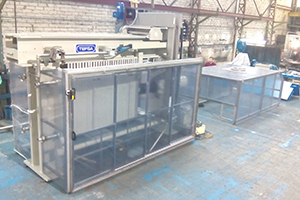 TEFSA supplied two (2) ATEX filters with individual enclosure for each filter to one of the plants of Nyrstar. 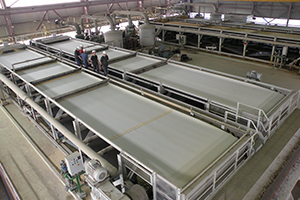 Two (2) overhead automatic membrane filter presses model PEH 1500 with automatic washing system were supplied by TEFSA to the Bulgarian Company RUA for the filtration of iron and barite concentrates. 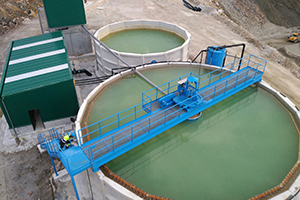 El Espinar WWTP in Spain has recently integrated three (3) ROTO-SIEVE system units in replacement of all the pre-treatment equipment taken into account in the project (sand removal system, degreaser and conventional sieves). 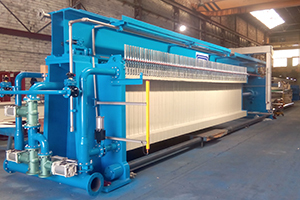 TEFSA has supplied three (3) filter presses with 2000 x 2000mm plate size for potable water plants systems, operating in the dehydration stage from the river water. This project provides the Bangkok tab water for more than 15million people, with sanitary warranties. 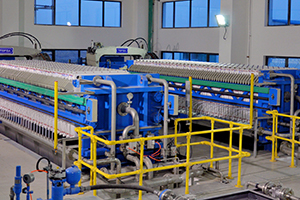 TEFSA has provided two (2) filter presses model EHPT, complete automatic sidebar system, to the Guogongzhuang WWTP located in Beijing. 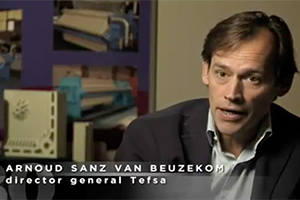 TEFSA took part as one of the companies broadcasted on the national prime-time television program “30 minuts”, on an episode focused to companies with active export activities and business around the world. The show “Fabricado en” (“Made in”) explains the activities and products developed at our Company during the last 40 years of work experience. 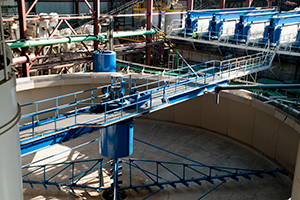 Six (6) TEFSA Thickeners and nine (9) TEFSA Filter presses sized with 160 plates of 1500 x 1500 mm, were supplied for the sludge treatment and dehydration decontamination process. 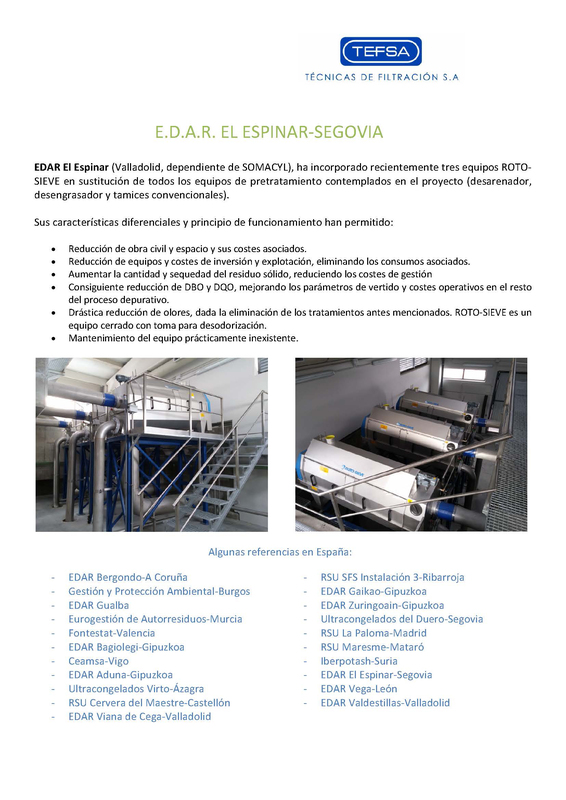 TEFSA supplied one (1) filter press to Cervezas Damm (one of the leading breweries in Spain) for the main factory in El Prat de Llobregat (Barcelona). With this filter press they achieved to reduce the earth residual moisture used in the bier clarification process from 90-80 % down to 50 % (a reduction of 76 % of the generated waste). Installation provided with double touch screen, allowing the equipment status view from the main control room. A full automatic membrane filter press was supplied to INTERQUIM BENIEL to be installed inside a cleanroom space and work under and according to the “GMP Norms”, consequently, the unit has been manufactured with all necessary finishing protections. The membrane filtration pack allows us to obtain a higher cake dryness and better performance on the cake washing process, which is a key factor of importance inside the pharmaceutical sector. 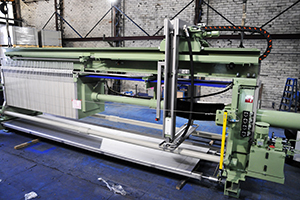 The provided automatic overhead filter press transport system implies a clean and free operation, as the tension rods are placed at lower level, allowing an easier discharge, easier cleaning and improved maintenance processes, in addition to a complete automatic operation and full stainless steel construction of all parts. Our control panel, provided with a communication card, allows the equipment integration into the existing plant control system. Our daughter company MEDIOS FILTRANTES has a wide range of anionic and nonionic flocculants for water clarification process. We provide our laboratory team to perform the relevant testing process to determinate the reference that allows us to get faster decantation, better water clarity and lower consumption. TEFSA has finalized the supply, assembly and start-up of four (4) Vacuum Belt Filter for the flue-gas desulphurization process in the ENDESA Thermal Power Plant located in the town of Andorra (Teruel, Spain). 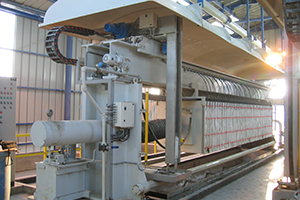 The TEFSA Belt Vacuum Filters have been supplied in order to replace the old equipment; each unit has a filter area of 63 m2 and processes 150 m³/h of gypsum slurry. 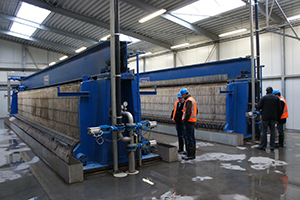 TEFSA supplied two (2) PEH-1500 model filter presses to one of the main sand treatment and soil decontamination companies in the Netherlands. 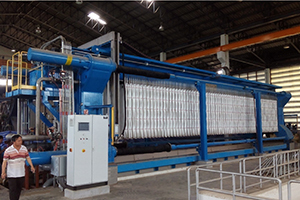 The filter units are equipped with washing system device that allows a full automatic wash of the filter cloths. 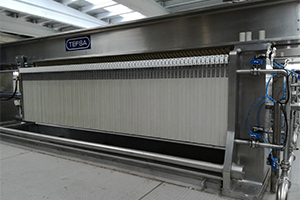 TEFSA has supplied ten (10) membrane filter presses model PEH-1500 model, for one of the main waste treatment plants in Guandong Province in Southern China. With these references, together with other relevant references in China on diverse applications, TEFSA has become one of the main foreign filter press brands and suppliers in China. 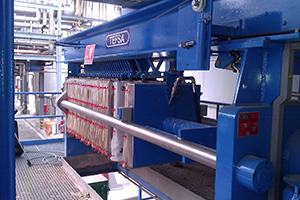 TEFSA has supplied 11 Filters presses with 1300 x 1300 mm plate size for the Phosphoric Acid Filtration process at Groupe Chemique Tunisian (GCT) for their factories in Gabes and Skira. These units are completely automatically operated and manufactured with special contact part protections in Uranus B6, all accessories are made in Uranus B6 as well.